UNICRYL is a single component and easy to use resin which gives excellent structural preservation of tissues without chemically interacting or crosslinking with them. UNICRYL is largely hydro-philic, allowing good access to polar solutions and exhibiting low background staining or labeling from hydrophobic materials. It also minimizes the denaturation of proteins, allowing true antigenic properties to be maintained. The excellent polymerization properties of UNICRYL are largely due to the fact that all of the components of the polymer have similar molecular weights, ensuring even penetration into the tissue. In addition, the enhanced labeling, staining and hybridizing qualities arise from the fact that sections are cleaved from the block face ahead of the knife edge, thus exposing more of the tissue components at the surface. UNICRYL is premixed and supplied as a single component. The resin has a long shelf life when stored in the cold. It is miscible with alcohol and has a low viscosity even down to -50°C. The resin can be polymerized by heat (50-60°C) or by UV irradiation at low temperatures (-10 to 20°C). The polymerization of the resin is an exothermic reaction. Unicryl shrinks approximately 10% in volume during polymerization. Ethyl alcohol, acetone and many other solvents may be used as a dehydrating agent. Complete instructions come with the kit. 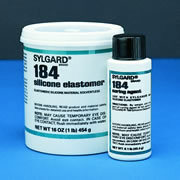 The Kwik-Gard™ is a specially packaged Sylgard™ 184 silicone that offers a quicker and easier way to apply the silicone, eliminating the messy procedure of preparing the mixture before application. Its special cartridge controls the precise mixing ratio to ensure proper curing. The disposable tip mixes resin and hardener as they are dispensed. Since no air is introduced during mixing, the resin does not need degassing for most applications. The mixed silicone is applied directly to the site, reducing preparation time and material waste. 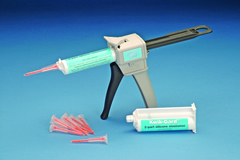 Each Kwik-Gard™ cartridge contains 37 ml of resin and hardener. The dispensing tip has a dead volume of 0.75 ml. Curing time for this silicone is 24hrs @ 25°C, and 15 min. @ 150°C. Same as the Kwik Gard™, but in its original container. A two-part silicone elastomer, ideal for potting and encapsulating applications. Very low dielectric constant sealing compound used in patch clamping and many other lab applications. After cure, will withstand -55° to 200 °C. Curing time for this silicone 24hrs @ 25°C, and 15 min. @ 150°C.